The Rookery Post-Turkey Tequila Secret Santa Party - Oak Beverages Inc. The Rookery Post-Turkey Tequila Secret Santa Party, Wednesday, December 12th, 7pm – 9pm. 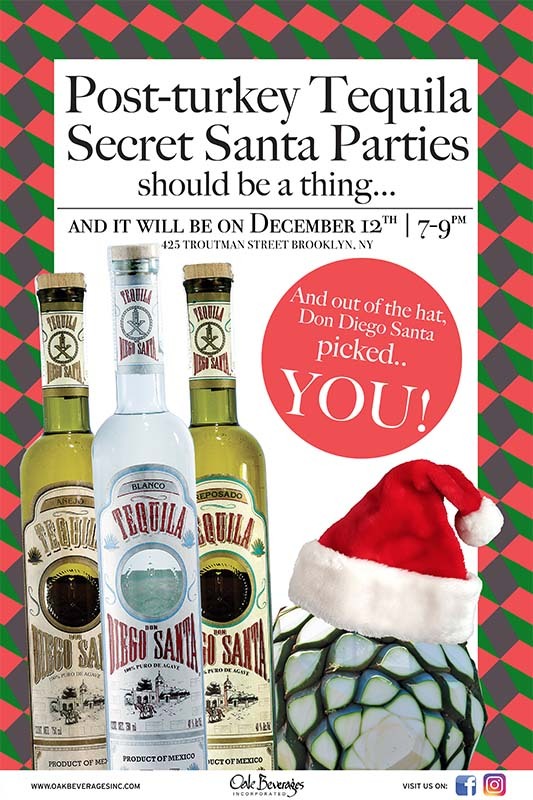 Post-turkey tequila secret Santa parties should be a thing… and it will be on December 12th! Produced only by the traditional and time-proven manner of slowly cooking the Blue Agave in small batches, one small batch at a time, in stainless steel pots. This is without question an expensive and time consuming process but is the only way to make the finest quality tequilas and the only way the tequilas of Tequila Don Diego Santa™ are made. In 1943 a small tequila distillery with the name of Destilería Río de Plata was established in Guadalajara, Mexico. Creators of Tequila Don Diego Santa™, they introduce us to three authentic and traditionally styled tequilas, handcrafted using only small pot distillation. Rookery bar is a contemporary Brooklyn pub housed in an industrial space, with an outdoor front beer garden and 16-foot horseshoe bar. we’re serving carefully chosen draft beer on tap (always 20oz imperial pints! ), classic and contemporary cocktails, wine, and british-west indian inspired pub food. we open daily at 12pm, and 11am weekends. located in bushwick, at 425 troutman street, between st. nicholas and wyckoff ave, one block from the Jefferson l stop. be sure to follow us on instagram @therookerybar for specials, updates, and news! Posted in Christmas Party, Holiday Party, Tasting Event.